Eek, once again I’ve been a bit slow on all things blog – been a busy bee with real life work and also planning our first Dinner at the Manor event so once again I’ve let things slip!! This weekend I made a very simple, tasty fig, hand sliced prosciutto and buffalo mozzarella salad as a nice light lunch for me and the husband. Now in the past I have always had a bit of an issue with meat and fruit combinations, but I think I am slowly overcoming this. 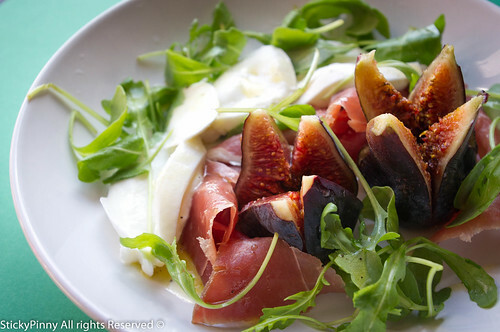 The sweet fig really cuts through the salty ham and the mozzarella adds a creaminess and binds everything together. The recipe I have hashed together from memory from a very old episode of the Naked Chef. I don’t know how accurate this is but I thought it tasted great and so did the Husband. Criss-cross cut the tops of the figs and squish their bases so they open up and place them on a plate. Take slices of the prosciutto and weave them around the figs. Place slices of the mozzarella around these and then throw on the rocket leaves. Mix together the dressing ingredients and spoon over the plate. Serve with some ciabatta / foccaccia so you can mop up the dressing!